The fight to represent the Lotus brand in Formula 1 escalated this week when Group Lotus announced a major tie-up with the Renault F1 team. 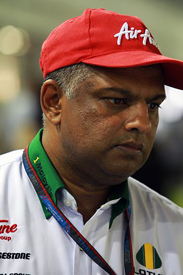 Team Lotus chief Tony Fernandes spoke exclusively to AUTOSPORT about the ongoing controversy and his team's position. Q. This week Group Lotus announced that it was becoming title sponsor and shareholder in the Renault team. What is your reaction to that? Tony Fernandes: My first reaction is obviously disappointment. We were originally given a mandate for five years to go and develop a Formula 1 team. There are comments that have emerged in the Malaysian press that Proton was disappointed with our performance, which is one of the reasons that they gave up. I don't know how anyone in their right mind could expect us to be competing in the top half of the grid, or even up in the bottom half of the grid, last year - having just been given an entry in September. I stand by the fact that I think we did very well in the year and I think that 99 per cent of the paddock would agree considering where we came from. We built a classy team, a team that could do pit stops in the same time as Ferrari - we looked good, we had a good motorhome and performed well on the track with two good drivers. We were the best of the new teams. We had two good drivers and Heikki Kovalainen said he had the greatest season he has had in F1 – which is great testament from a guy who has driven for McLaren and Renault. So I am a bit disappointed that we did not get a chance. I always wanted to be a different team to Team Lotus – because Team Lotus was Clive Chapman's family, and I always hoped we could somehow give it back to him. I originally wanted us to be called the Lotus F1 Team, but Group Lotus said we were not allowed to do so because they thought David Hunt would come after us – which was an admission that they knew something was wrong. Logically I think we could have built a great brand together. I think this year if anyone says that we didn't help Lotus then I think they are mad, because we have helped them. And the reaction from the public is very strongly in support of us. So I think given time we would have built something good, and the perfect scenario for me would have been a merger of the two with one ambition. But this changed dramatically when Dany Bahar came along. He has had a tremendous influence on Proton's management, particularly the chairman and CEO – who has not come to many F1 races. It is sad that it has happened but that is the deck of cards we have been handed and we will deal with it. Q. So where does this leave your plans for 2011. On the entry list you are down as Team Lotus and you are the only team that will be running a Lotus chassis next year. Are you pushing on with staying as Lotus? TF: Yes, we will push on. I have no problem that there will be two Lotuses on the grid. But I do think it would be ludicrous if we are both black and gold, and I can inform you that we will be changing our plans for the colour scheme. We declared that we were going to run in black and gold, and I'm not going to be childish to say we were first with our plans, so we will do it whatever. They have painted their car black and gold, they have made their intentions clear on that front, so be it. But every cloud has a silver lining, and I received some messages from people suggesting that by being black and gold we would be promoting a cigarette company. I wasn't actually aware that JPS [John Player Special] was still being sold in the United Kingdom and various parts of the Commonwealth. So did I need that controversy? No. And after yesterday's announcement by the FIA about the new engine plans for 2013, which means F1 is going green – so what better colour to be than green? So, we have been testing our fans' reactions and many have come back to us to say we should stay green and yellow. So, I am 99 per cent sure that we will be green and yellow. Q. Where are we up to in regards of the legal disputes about the use of the Lotus name? TF: That is still going through, and we have launched the declaration proceedings to try and sort it out once and for all. So that will be going through the courts next summer. Q. Do you still feel there is a value for your team sticking with the Lotus name, with the car company throwing its weight behind another team? TF: Yes. We are not stupid in wanting to promote somebody else. We have our own plans and we went into F1 with our eyes open. Obviously we did not expect what has happened [with Group Lotus] and we would have loved to be involved in developing the Lotus car brands, and other brands associated with it. But we have now ended up with Team Lotus, which is a super brand and we have many, many ideas that we will progressively look at. We are not emotional to say that we will do something just for the sake of it, but we are emotional in terms of feeling responsible now to many, many fans who want us to stay at Lotus – and most of my staff are emotionally tied to the brand. But we have to be careful about not destroying something good through lots of court cases, and not being able to build a strong Formula 1 team by not having a good revenue source. But we think we have solved those issues. Q. What would your message be to fans of Lotus who may be wondering about which team they will support in 2011? TF: I think it is a situation like Manchester United v Manchester City. You have to take your pick! If you are from Manchester you have to choose which team you want to support. In F1 you can support the black and gold Lotus, or you can support the green and yellow Lotus. It is really up to you. On the track we are not going to be faster than them at the beginning of the season, that is the reality. But let's see where we get to at the end of the season. We have a very, very fired up Mike Gascoyne – who was told by me that Dany Bahar's main reason for not being with us was that he felt Mike was not good enough. So that helped me tremendously in motivating people. We have to be real, though. They have 30 years' more experience than us, and have lots more money and bigger facilities that we don't have. But in two years' time let's see. It was a car manufacturer's team before, but it won't be anymore. Proton and Lotus do not have the financial muscle of Renault – that is a reality. So they will be equalising to us soon and become a more independent team. Q. Have you been surprised by how much support you have received from fans in the days since the Lotus Renault announcement was made? TF: In some ways, they have done us a bit of a favour. But you cannot win people overnight. This support we have got has been built up over a year. As I always say, things take time and things have to be done properly. You cannot parachute yourself into a brand. If you look at all my business strategy I have always believed in organic growth. It needs foundations and it needs strategy. You cannot parachute into something and say it is yours. People are not stupid any more, and I think the reason for the support is the people see we are trying to do something the right way. I am not Colin Chapman, and I never will be. He is a legend and we are not going to emulate him – but everything he did is what we are doing. He built it from scratch and did not buy into anything. You have to have brands that people love. There is lots of competition out there and people have to have respect for what you do. In many ways if Group Lotus had supported us it would have been better for our brand, but over the whole year they did nothing with us. They could have done so many things with us, which would have got people gravitating towards them. How Dany Bahar can say we were not good enough, I don't know. He never came to see us, he never came to Hingham. He wants to create a Maranello – but Ferrari was not created overnight. Enzo Ferrari did not go and buy something, he built it from scratch. There was the car company and the racing team and they were together. But in their [Group Lotus] case they have Enstone, which is called Renault, and Hethel in Norfolk – while we are in Hingham with land to build a windtunnel and facility there. Unfortunately ego and power all comes into play and logic gets thrown out of the window. Q. What feedback have you had from other team bosses and Bernie Ecclestone about the situation? TF: You will have to ask the other team bosses and Bernie about that – it is not for me to say that. But we are registered as Team Lotus. And we have not had any comments from the FIA and FOM saying there is any problem with that, and Bernie has said several times that we have done a good job and we deserve to be there. So we will leave it at that. Q. Has this talk over the name been a distraction in your preparations for next year? TF: No. If there is one thing my year in Formula 1 has taught me, it is that there is never going to be a dull day. You have to separate getting on with the job from the distractions, and I have been well trained about that in the airline business. So if anything I use it as a motivation and I use it as a motivation to the staff. This year we beat Virgin Racing, so now let's try and catch up with Renault. We are not going to be able to do that straight away, but where there is a will there is a way. Q. So how are things looking car wise for you then? TF: The windtunnel is going very well. We are working hard on the blown diffuser at the moment. We have good people there. We have two good drivers, and I have always said that consistency is key. So having them there with their engineers is great. We will have our CFD cluster up and running soon. So we may not be as fast as we want to in Bahrain but by Abu Dhabi we will have a good car.